Here is a rundown of the best gopro gimbals on the market at the moment. I've tried to get the most recent products that have made it to market, and when I can, I'll link through to an in-depth review. Depending on the type of camera you are using there are a few different options. There are gimbals for mobile phones, for action cameras like GoPro, and you can also get gimbals for DSLRs that mount using the standard tripod mount. As I'm into action sports, I mainly use my gimbals for snowboarding and for MTB, but using a gimbal when you're traveling is also great. It makes any home movie look professional! What is the Best Handheld Gimbal? It really depends on what you want type of video you are filming and the conditions you will be using the gimbal in. If you are into serious film making, and you shoot video with a DSLR, then you should buy a gimbal that can support your DSLR camera, possibly even a two handed gimbal. 3 axis gimbals have largely taken over from the old fashioned 'steadicam', which used to be standard on film sets. FeiyuTech make a great selection of DSLR camera stabilizers. Their newest product is the FeiyuTech MG v2 for Mirrorless cameras. If money is no object, then a professional gimbal like the Freefly Movi carbon or the DJI Ronin will set you back thousands of dollars. If you mainly shoot with your smartphone, and need something light that can make those home movies look professional then you need a smartphone stabiliser. 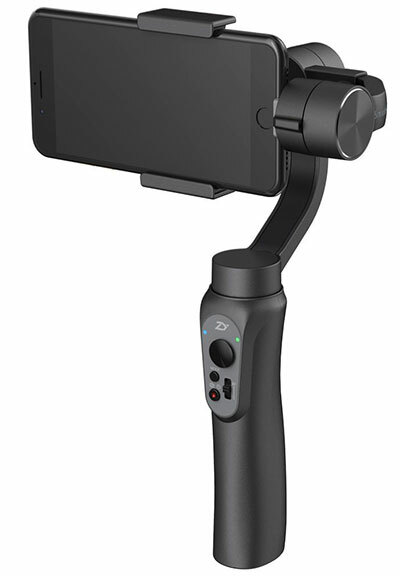 The best smart phone stabilizer at the moment is the FeiyuTech SPG stabilized handheld gimbal. You smartphone is mounted using a special bracket and will make your videos super smooth. This model has recently been updated with a two hand version, the SPG Plus if you need better control. I mainly use my gimbal for stabilizing my gopro footage. A go pro gimbal is an amazing tool if you are trying to take great silky smooth footage of your friends riding in the snow park or mountain biking down a trail in the forest. There are a great selection of GoPro stabilizers on the market, because of the popularity of GoPro cameras. Our favourites at the moment are the REMOVU S1 GoPro gimbal, The EVO GP 3 Axis Handheld Gimbal, and the GoPro Karma Grip which you can find reviewed below. If you don't know your pitch from your pan, or simply have no idea what a gimbal is or why you would need one, head on over to my Gimbal Buyer's Guide which explains a few things and what you should look for when buying a gimbal. The Feiyu-Tech WG2 is a 3-axis gimbal stabilizer without the standard handle but is rather a wearable and mountable model. Building on the very successful Feiyu Tech WG, it overcomes some of the bad points of the previous model, and adds some exciting new features. The WG2 is built with three brushless motors and an algorithm that's especially optimized for wearable operation. The algorithm, which calculates the rotation angle, is designed with improved anti-jamming capability for high-frequency jitter and high-speed motion scenarios. A welcome feature over the old Feiyu WG is full 360 rotation on two of the axis. This means you have more freedom of movement with shooting, and more mounting options. As is the trend at the moment FeiyuTech have released an app to control the stabilizer. The app is available on Apple App Store and Android Play. The app allows for remote control operation of the gimbal, adjusting settings, and firmware updates. An optional Feiyu remote control (model # WGWR) is also supported. The Feiyu-Tech WG2 has been rated IP67-Level Waterproof. It's modest waterproofing. In real terms this means that it can stay submerged under 3ft (0.75m) of water for approximately 10 minutes with no trouble at all. So that means you aren't going ot be taking it scuba diving, but using it snorkeling, on a rainy day, surfing and so on, should be no trouble. The WG2 is a welcome upgrade to the excellent WG. The waterproofing will let you rest easy when taking the gimbal out in the rain, mud or snow. It's an all round improvement, and I'll be swapping it for my old WG straight away. If you are in the market for a wearable gimbal, then this is the one to buy. 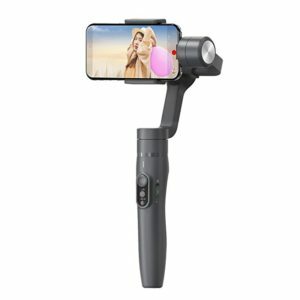 The Zhiyun Smooth-Q Smartphone Gimbal wants to be an indispensible part of the filmmakers toolkit. 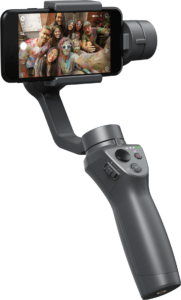 By mounting the phone in a 3-axis handheld gimbal, vibrations from the hand of the user almost disappear. 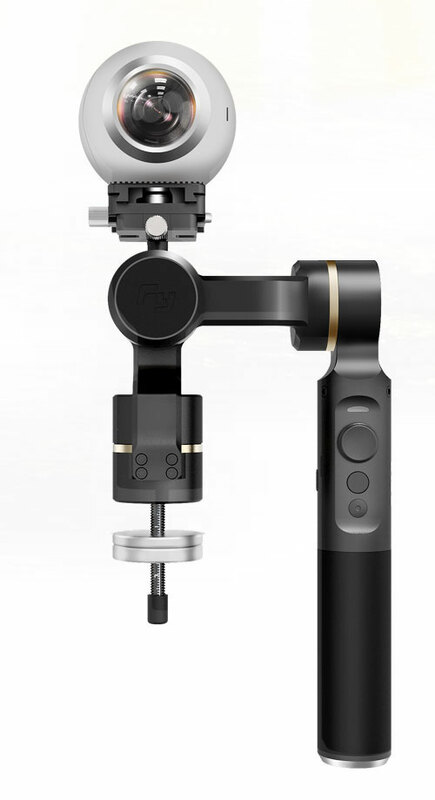 Zhiyun first appeared on the scene in 2015 releasing the Smooth, their original smartphone gimbal, in May that year. 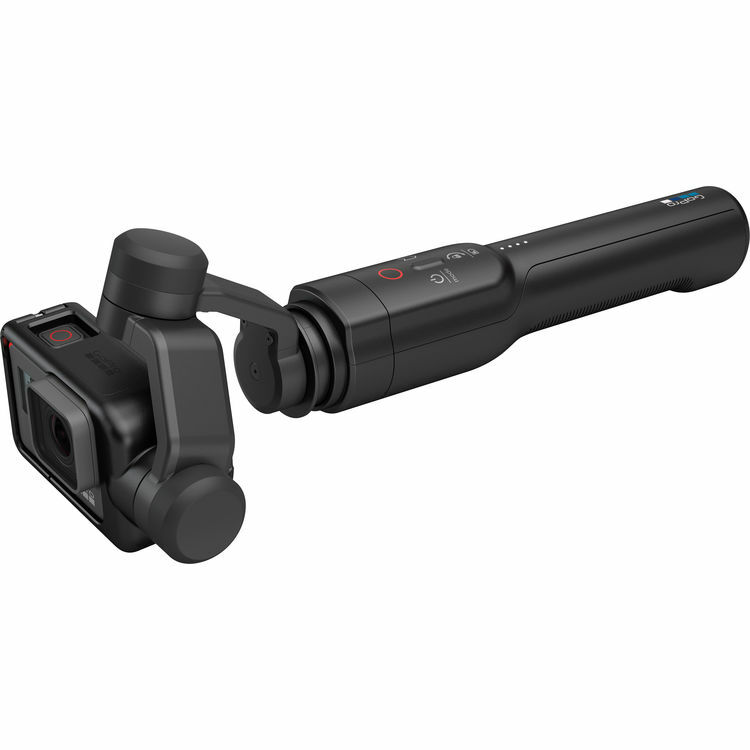 The Zhiyun Smooth-Q was released in March 2017 and is positioned as the budget friendly consumer friendly model, to sit alongside the Zhiyun Smooth 3. The Smooth-Q comes in four colours, classic black, gold, rose gold and space grey. It also comes with a hard case which is great for transporting the gimbal. Zhiyun designed the Smooth-Q to appeal to a mass market. The construction is plastic, and although the gimbal does feel solid, holding the smooth plastic handle isn't as reassuring as holding a textured grip. Zhyiun have come up with a simple solution that makes it quick to balance the gimbal. 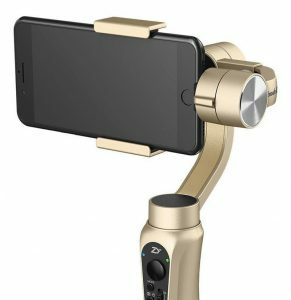 Using thumb screw, you can adjust the arm length of the gimbal, as a result, the gimbal can hold a range of sizes of mobile phone easily. See our full review for more info. The Zhiyun Smooth-Q comes with a massive 26650mAh battery. Zhyiun say this is enough to power the gimbal for 12 hours, in our tests it was a bit less than that. On the bottom of the handle, Zhiyun have placed a standard USB port to charge your smartphone. It's a great idea, you can find a similar thing on the EVO GP-Pro Gimbal. It does prove hard or even impossible to plug the phone in while it's in the gimbal though, so not as useful as it initially seems. Filming with the Zhiyun Smooth-Q was a good experience. The gimbal auto calibrated when I switched it on, and was ready to shoot straight away. The 3-axis gimbal did a great job of stabilising the video footage, on a range of smartphones I tried it with. I didn't test it with a GoPro, but I can imagine it will work just as well. In summary, if you are on a budget, or just starting out making movies with your smartphone, the Smooth Q is a good choice for a cheap gimbal. 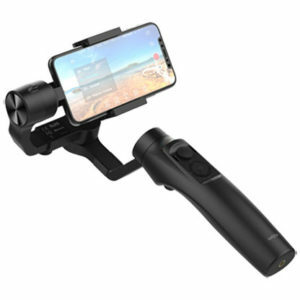 However, if you can afford it, or will be using the gimbal often, then spending the money on a higher quality 3-axis smartphone gimbal like the DJI Osmo Mobile might be a better option. EVO Gimbals are a US-based business that have been making professional and 'prosumer' 3-axis stabilizers for use with GoPro cameras, Small DSLRs and smartphones. 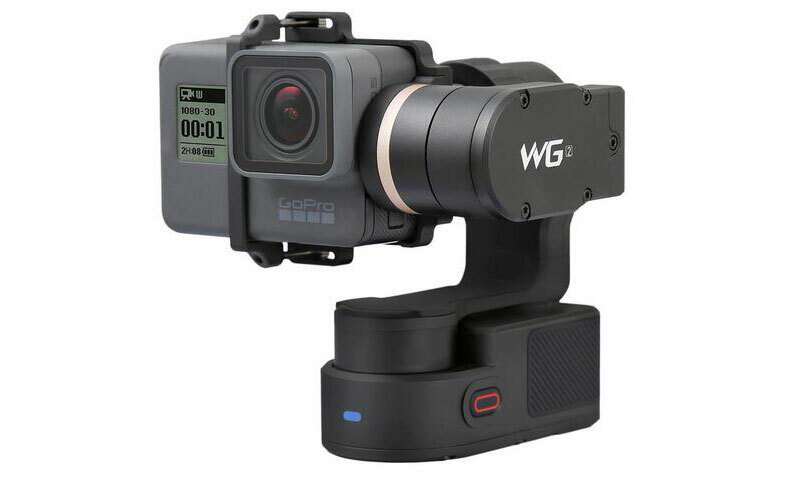 The EVO GP Pro comes with attachments for mounting The original GoPro Hero 3/4/4+ series, and also GoPro Session and the Garmin Virb 30 action camera. Pretty useful if you have a few different cameras you use regularly. Forget about having to carry an extra GoPro battery, The GP Pro has you covered. It features a built-in charger that can power your GoPro. It makes battery changes a thing of the past. Two 2000 MAH batteries power the charger. It helped me extend my camera usage - almost three times over! One of the unique features of the EVO GP Pro series is the four-way thumb stick for precise control of your tilt, pin, and roll axes. The joystick translated in to quick changes of the pan and tilt of the GoPro. I can imagine making use of the pan controls when using the gimbal for 'follow cam' situations. Connect a field monitor to the handle and you can preview the video footage in real time. This stops you guessing where you are pointing the camera, and can also be used to watch your footage after you've finished filming. All in all, another great entry to the Gimbal market. the charging cable is a very useful addition, and although most users won't need to touch the AV out it might be useful in a more professional situation. I look forward to seeing what features EVO Gimbals add to the next version. With the G360, FeiyuTech set out to create a gimbal that could adjust to anything from a digital camera, to a GoPro, to a phone. Using its unique 360 panorama capabilities, the Feiyu-Tech adopts a counterweight system that places a hanging weight to the side of the handle. This allows the camera to pan all the way around but does mean you have to be careful that your arm doesn’t bump the weights. The FeiyuTech G360 uses a 22560 Li-Ion battery which offers up to 6 hours runtime on a single charge. This is a great figure in the gimbal category, and FeiyuTech knows it. The 6-hour battery life is amazing and ensures your camera will run out before your gimbal does. While you are free to mount whatever camera you want on top of the G360, if it weighs more than the counterweights beneath it, the gimbal is likely to lose control. If your use-case falls in line with the FeiyuTech G360’s strong points, there shouldn’t be a problem. That means if you’re looking to get panoramic shots of family parties, BBQs, or sporting events, you’ll be fine. Feiyu-Tech has also designed an accompanying smartphone app which allows you to control the G360 wirelessly. 3-Axis stabilizing gimbal, offering PAN, FOLLOW, LOCK modes. Manufactured with world class brush-less DC motors and rotary sensors, the S1 delivers extremely stable professional shots in any kind of activity. 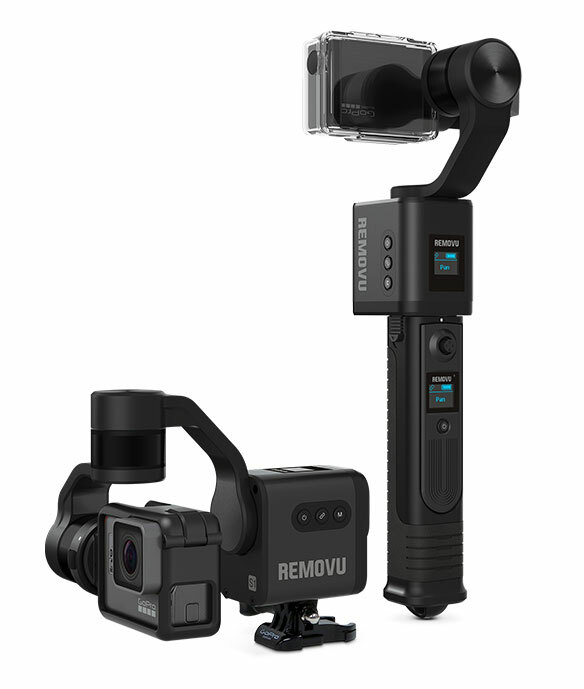 The REMOVU S1 is actually made up of two components: the gimbal itself, and the handle. The camera mount can be separated from the handle and mounted anywhere to offer portable shock protection. Also the S1 bills itself as the world’s first fully rainproof gimbal. Do the advanced controls and independent mounting excite you? If so, you wouldn’t be doing yourself a disservice by investing in the REMOVU S1 3-Axis GoPro Gimbal. Compatible with most GoPro mounts, Karma Grip captures the amazing handheld, gear-mounted and body-worn perspectives only a GoPro can-now with pro-quality stabilization. Ease of use might be the Karma grips main selling point. There are only a few buttons, and they all control relatively straightforward features. Simple built-in camera controls let you power on and off, change modes, start and stop recording, or add Highlight Tags on the fly. While some people will certainly appreciate the ease of use, other will find themselves yearning for more options. At $300, it’s hard to say that the Karma is a great value, even when stacked against the more expensive REMOVU S1. Read our full GoPro Karma Grip review. 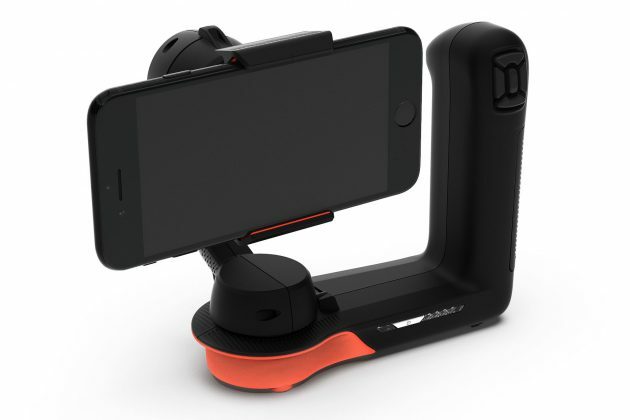 Feiyu Tech is a company that specializes in making mounts for GoPros, phones, and cameras. The G4 is rated for 4 hours of use while using the included rechargeable batteries, and comes packaged with four total batteries. Heading follow mode is a great option for filming panoramic scenes, as it allows the camera to pan left and right, but prevents vertical movement. Heading and pitch follow mode allows the camera to glide from left to right, up and down. You can choose to lock the camera in place along all three axes, or by clicking the single button to select modes where the camera will smoothly follow as you pan and tilt the handle. The brushless motor allows the cameras ultra-smooth vertical movements to be locked in at any angle while retaining the ability to pan horizontally. In today's world sharing what activities or events you are taking part in is a big thing. Some of this information is shared through posts on social media websites but videos and pictures are even more popular. In order to share a clear picture or video, the camera/phone has to be stable. That is what the GoPro Gimbal is designed to do, stabilize your camera for the perfect shot. Now there are usually a lot of questions about the Gimbal, especially for those who have never heard of one before. The following paragraphs will explain what a Gimbal is, what it can be used for, Gimbal manufacturers and other helpful information. A Gimbal is a device that allows an object to rotate around a set axis, such as a ship's compass and gyroscope. For cameras, this means that you can get those desired shots and videos without being too concerned about whether the camera is tilted a certain way or not. The Gimbal also keeps the camera steady to ensure clarity. The Gimbal can tilt in many different directions so that no matter what type of shot is needed it can be attained with ease. There are many different styles of Gimbals, which one you get depends on the type of videos and photos you are trying to get. Why should I use a Gimbal for my video? The reasons for using a Gimbal are very simple. Whenever you are trying to catch that perfect shot you want to make sure it is taken at the angle you want and is stable enough to catch a clear picture. In reality, no one has a steady enough hand to get the perfect clarity 100% of the time. The Gimbal will stabilize the camera being used and also offer a wide range of angles that can improve the quality of the photo or video. This is reason enough to use a Gimbal. The primary function of a gimbal is to mechanically isolate the movement of the person (or vehicle) from the camera, to eliminate shaking video footage. Different types of gimbals achieve this in different ways. There are those that are motorized and those that are not. Now there are several differences between these types of Gimbals, cost being one of them. However, the level of control is also different. When using a motorized Gimbal all that needs to be done is to set it where you want it and then start filming. This is great if you intend to get some fast moving shots, like filming a certain type of racing event. With the motorized Gimbal you can get it set in the position needed and mount it to a wagon or another type of mobility, then all that is left to be done is to take your shots. In the case of non-motorized Gimbals, they do have one major advantage over the motorized ones, there is a wider level of minute control. With a non-motorized one, you can adjust the angle of the camera and deviate from a set angle without running the risk of losing the shot. The motorized counterpart cannot deviate in this area like the non-motorized Gimbal. Each has advantages and disadvantages, the best thing you can do is to consider what kind of shots you are trying to get. Again, this is just a general overview of two types of Gimbals that encompass a wide range of different products. A Gimbal is a great tool to have when trying to film sports that have a lot of fast moving action. Here's an example that will give you an idea of why this is a great tool. Say that you were going to go windsurfing with friends and wanted to video the fun. Well, having a Gimbal would ensure that you got a great video at any angle. Your friends could hold the Gimbal with your camera mounted on it and video your take off and landing. Then after the ride is over you could relive the fun through the video and share it online. Keeping a camera steady and at the perfect angle during an exciting time is next to impossible so using the Gimbal can enable you to get a clear, steady shot that you will be proud to have. Most of the GoPro Gimbals I have covered in the above paragraphs concerns handheld ones. However, you can get accessories where you can mount the Gimbal and there are even those that can be worn. That's right, you can even purchase those to mount on a helmet or drone. These can enable you to get either a first person view of what is happening or a bird's eye view. Now, both of these should be used responsibly and for your own enjoyment. Especially when it comes to using those designed to mount on drones. If you are considerate and careful then both of these mountable Gimbals can be very enjoyable. Now, both of these should be used responsibly and for your own enjoyment. Especially when it comes to using those designed to mount on drones. If you are considerate and careful then both of these mountable Gimbals can be very enjoyable. Some Gimbals come with remote controls that can greatly enhance your control when at a distance. You could be standing 15m away and still be able to control the shots you get with the GoPro Gimbal. Now, these remotes can either be wireless or be attached with a wire to the Gimbal. Another accessory that can greatly improve your GoPro Gimbal experience is the extension poles that can be attached to your device. That way if you have a group video or picture that you want to take but need a little more distance you can just attach the pole and get that perfect shot. Again there are two types of extension poles, just like there were two types of remotes. There is the extension pole that has to be put together to reach the desired length and then there is the adjustable extension pole that is already assembled. There are many things to consider before buying a Gimbal. Below are listed some points to think about before you decide on a product. This is a major point for many people when it comes to deciding on which product they want. 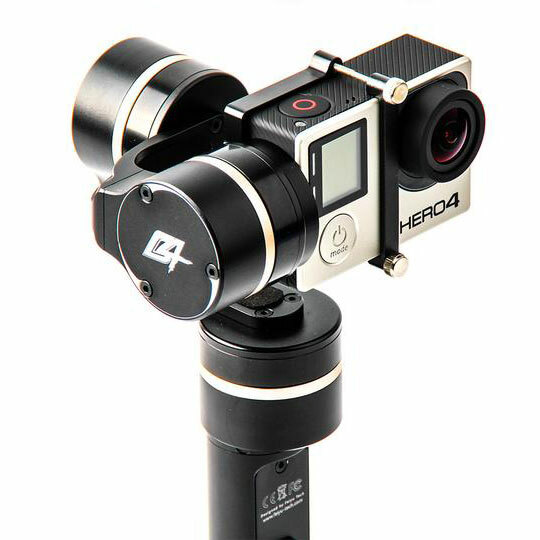 There is a wide range of GoPro Gimbals to choose from without spending a fortune. Be sure to compare prices from different websites in order to get the best deal possible while at the same time getting the product that will do what you need it to do. Here is another important point to consider. While some GoPro Gimbals may have major features that sound great you need to determine what you will actually need. Think about what you will be using it for and then research the features accordingly to find out which Gimbal offers the features that are most important to you. Also, consider where you will be using the GoPro Gimbal and make sure that it will function in the surroundings you will be in. Some Gimbals are compatible only with certain types of cameras or phones. Be sure to find out if the Gimbal you are considering will work with your device. Sometimes this can be a major slip up when a purchase is being made, not considering if the product is compatible with what you want to use it with. The quality of the product is often something that people overlook. If it has a good price and is compatible with their device many will simply buy it right away. But, it is important that the quality of the Gimbal is taken into account. Read the reviews left by those who have purchased the same product, this can offer a lot of insight into how well the product is made and performs. Now, head on over to our product reviews to find out what is the Best GoPro Gimbal on the market at the moment. Welcome to GimbalReview! My name is Tim and I’m passionate about handheld gimbals and camera stabilizers. They make shakey handheld video a thing of the past, and I’ve made this site to help you pick the right one!